Is your firm using or looking to use cloud this year, but slowed down by concerns around protection of assets, increased complexity, and separation of duties in a self-service world? Our Wall Street customers, including Goldman Sachs, have faced the same hurdles with which you may be grappling. Despite these concerns, cloud discussions for our financial services customers have moved from “if” to “how" because of the much-needed flexibility the cloud provides. In just 30 minutes in our webcast on Wednesday, June 29th, we'll share the challenges our customers are encountering on hybrid cloud and the shape of the solution that will address these. We'll then demo Bracket's agentless security layer as it performs transparent, always-on encryption that your developers can't turn off—and won't even notice. 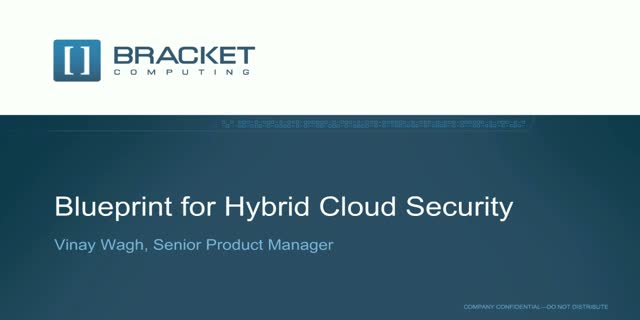 If you are involved in your firm’s adoption of cloud, joining our webinar with Adam and Tom Gillis, CEO of Bracket Computing, will give you the chance to: hear real-life, enterprise experiences with critical security needs on hybrid cloud, vet your security blueprint against that of enterprise-class peers, and engage in live Q&A with industry leaders in moving workloads securely to the cloud. Interested in harnessing cloud to crunch big data and reduce operational overhead, but concerned the security risks are too great? Our F500 customers have faced the same hurdles energy, oil, and gas firms are grappling with. Despite concerns about their valuable IP and data, cloud discussions for our customers have moved from “if” to “how" because of the much-needed flexibility the cloud provides. In just 30 minutes in our June 1st webcast, we will outline the must-know principles defining IT’s cloudy future and how our F500 customers are overcoming security challenges. We’ll then demo Bracket’s groundbreaking virtualization layer that is enabling enterprises in the cloud—and we would love to have you there. Is your company adopting or using cloud this year, but slowed down by security concerns? Our customers have faced the same hurdles you may be grappling with—operational complexity, concerns over encryption, and increasing developer responsibility among them. Despite these concerns, cloud discussions for our technology and software customers firms have moved from “if” to “how" because of the much-needed flexibility the cloud provides. In just 30 minutes in our webcast on Wednesday, April 27th, we'll share the challenges our customers are encountering on hybrid cloud and the shape of the solution that will address these. We'll then demo Bracket's agentless security layer as it performs transparent, always-on encryption that your developers can't turn off—and won't even notice. Webcasts on cloud, security and virtualization for IT professionals.